And it's not what you think. Follow the smell to the southwest wing of the high school and you will discover the Anatomy and Physiology students working on their dissection unit. MillIe Laughlin has been teaching the A&P class here at Valley Heights for six years. Each year, students are required to take part in a dissection unit, involving a small mammal (this year rabbits.) This past Tuesday, the fourteen students enrolled in the college course, received the rabbits that they will be working with for the rest of the school year. They began by making strategic cuts on the surface of the rabbit’s skin and afterwards separated the skin from the muscle tissue below. Megan Jones, a junior taking the class, says, “My favorite part about dissection so far was peeling the skin off of the back of the rabbit.” Megan and many of the other students were not phased by the sight of the skinned rabbits. “Other people find it gross what we do, but dissection is so cool and interesting. It’s such a fun aspect of the class,” Megan adds. You might be wondering why they slice into rabbits. Mrs. Laughlin explains, “Dissection provides a hands on experience with the anatomy of a body. In addition, the aspects of a rabbit can closely resemble that of a human, therefore helping the students better understand their own bodies and functions.” She also adds, “We will use these rabbits throughout the entire year to study multiple systems of the body, including the muscular, digestive, reproductive, and respiratory systems. 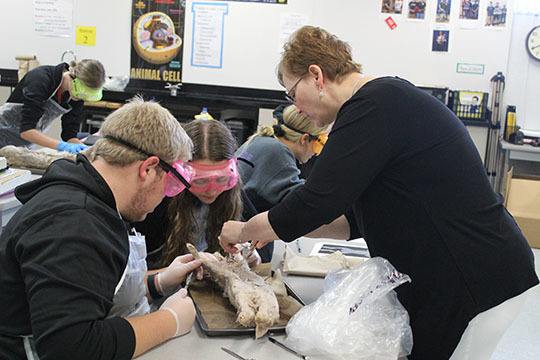 Students might even get the opportunity to study the central nervous system.” By the time spring comes along, the Anatomy and Physiology class will take a trip to Emporia, to visit a cadaver lab. While there, a professor will walk them through the lab, showing them a variety of cadaver dissections. Students will not get to perform a true dissection, but the opportunity will still provide them with some hands-on experience by examining a human body.